Just 200 metres from Sliema Beach, the Corner Hostel is a renovated Maltese townhouse offering a communal kitchen, and rooms and dormitories with a telephone and ceiling fan. Free Wi-Fi is available throughout the hostel. The NightCap Hostel offers bright, spacious dormitory rooms, set over 3 floors of a residential building in the heart of St. Julian's, Malta's night-life area. You can walk to the sandy beach of St. George's Bay in 5 minutes. Set in St Julian's, Boho Hostel features a garden with hammocks and sun loungers and a shared kitchen where guests can cook. It offers free Wi-Fi, a TV lounge with DVD player and dormitory rooms. 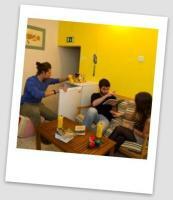 Located in St. Julian's, just a 5-minute walk from lively Paceville, Hostel Malti offers free Wi-Fi. Its dormitory rooms are decorated with brightly coloured walls.